This unique church has several connections to Kingston Penitentiary. Named “The Church of the Good Thief”, it was constructed from limestone quarried, cut and transported to the site by convict gangs. The church was built between 1892 and 1894, and designed to include a mixture of Neo-Gothic and Romanesque architectural styles. 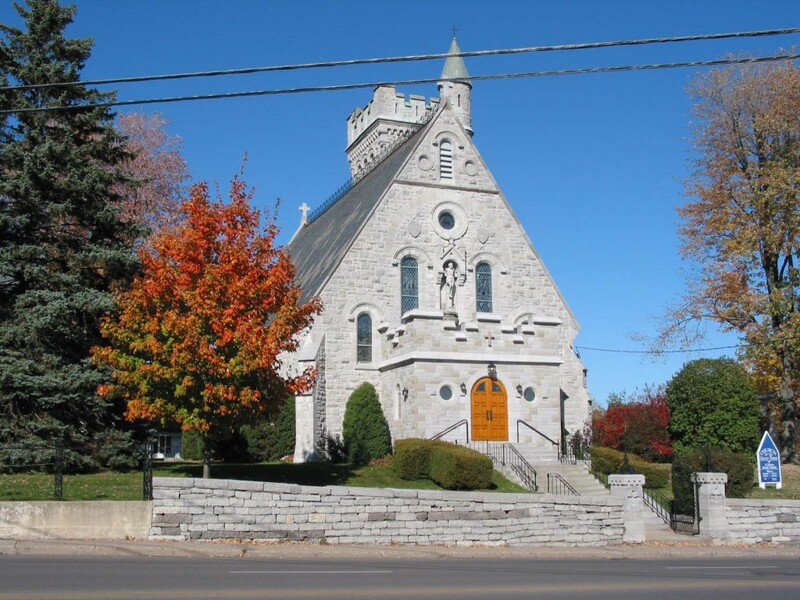 The first Priest of this Catholic Church was Father Cleary, who also became the Chaplain of the Kingston Penitentiary, further solidifying the link between the church and the prison. As well, many members of the parish were penitentiary employees. While many would assume that the church’s name is derived from this association, in fact, it is dedicated to Saint Dismas, who was commonly referred to as the “Good Thief” and remembered as one of the robbers who were crucified with Christ. 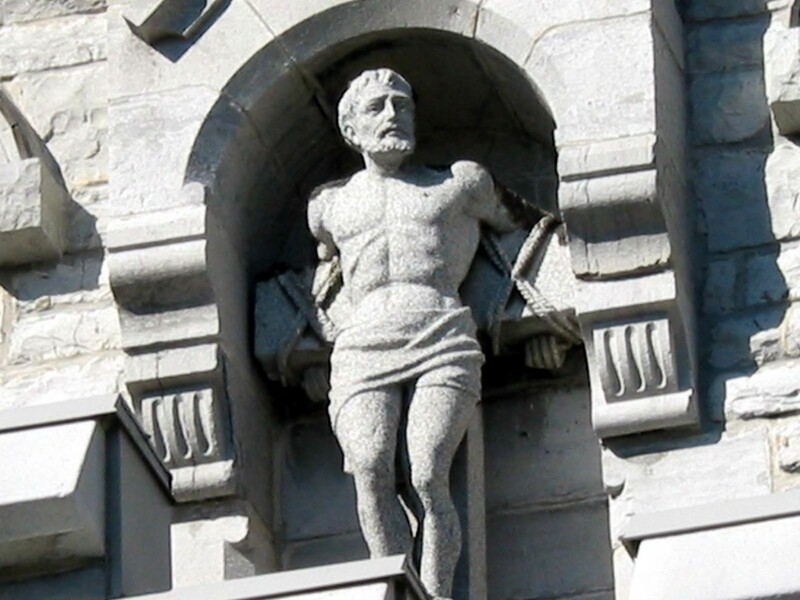 As such, St. Dismas is the patron saint of prisoners, criminals and reformed thieves among others. If you look directly above the door of the church you will see a stone statue of St. Dismas occupying a niche. The inmates of Kingston Penitentiary did not leave the prison to attend religious services. However, religion was very much emphasized during the early years of the penitentiary. It was thought that a lack of religious and moral understanding was one of the contributing factors that led to a life of crime. Religion was thus one of the central elements of reformation. It was thought that for “personal reformation to be permanent [it] must be founded on Christian principles” thus, “no system of prison discipline can be effectual in which religious instruction does not form a prominent part”. The chaplain was responsible for both the moral and educational welfare of each convict. The military presence in Kingston was considered an important asset to the penitentiary, as reinforcements that could be called upon for extra security if the need ever arose. However, the military also served as a source of prisoners from 1835 to approximately 1860. The incarceration of soldiers at the penitentiary reached such a high level that in 1850 a formal contract was drawn up between the military and penitentiary authorities establishing the “Military Prison of Canada West” within the South cellblock. This agreement remained in place until 1852 when it was terminated due to increasing civilian incarceration rates. While all prisoners at the penitentiary after 1842 were serving sentences of two or more years, military prisoners sometimes served as few as seven days. Their most common offence appears to have been ‘habitual drunkenness’. Military prisoners were treated very differently than their civilian counterparts, so much so that civilian prisoners perceived that the military were treated better in some ways. In the beginning the military were excluded from performing some of the hard labour that occupied the other prisoners. Eventually this was changed under Warden Smith in the 1840s. In fact, the roadway that now forms King Street West was excavated and graded by military prisoners. Internationally, within the penal systems, inmates develop a jargon of their own, with short forms and slang for many words used on a daily basis. For example prison guards and keepers were commonly known as “screws” among the inmates, in reference to the repetitive action of turning keys in locks. A new inmate would be referred to as a “fish” and to give a warning that a staff person was approaching, it was common to yell out “six!” which mean that trouble was on the way. A “shiv” is a prison-made knife. The term “kite” refers to a letter, a correspondence that is uncensored. Queen’s University Archives is able to provide a unique look into life in the penitentiary during the 1920s, as the Archives holds a collection of “kites” from that era. These “kites” form a correspondence between a prisoner named Joseph David Cleroux and Phyllis Halliday, a young woman who lived in Portsmouth village. This correspondence dates from approximately 1919 to 1921. Despite the lighthearted or practical nature of these letters, they are important documents in their own right as they provide an uncensored glimpse into a prisoner’s life. These letters also formed the basis of a novel written by local author Merilyn Simonds.